Europe didn’t head into 2017 under the best circumstances. Brexit was still relatively new and troubling, Italy’s oldest bank had just collapsed, and a series of upcoming elections were making investors nervous. Twelve months later, the success of Europe’s economy this year has been such a standout surprise it’s even been enjoying its own hashtag: #euroboom. Last month, the International Monetary Fund said Europe’s recovery was so strong it’s spilled out into the rest of the world, making the region an “engine of global trade” and economic growth. 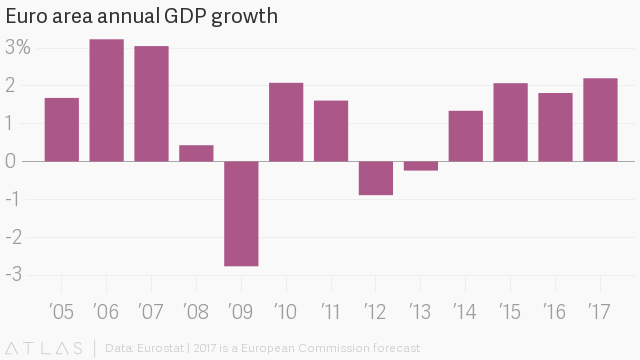 The euro zone is forecast to have grown 2.2% in 2017, the fastest pace in a decade, according to the European Commission. The euro has also gone from strength to strength. The common currency is set to gain about 13% against the dollar this year, making it by a stretch the best-performing G10 currency. Gains are likely to roll into 2018 as traders who think the euro is more likely to rise outweigh those expecting a fall. 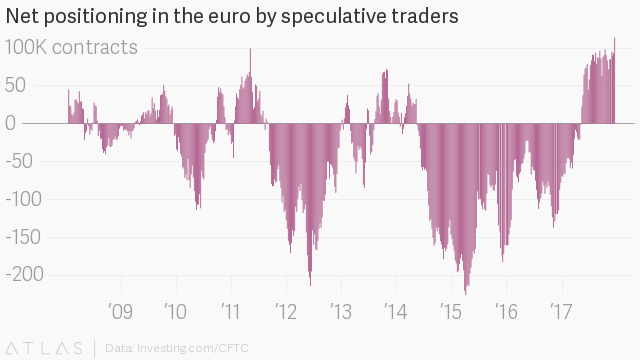 In mid-December, the net long positioning in futures and options contracts on the euro by speculative traders was the biggest for at least the past decade. An impressive turnaround, given that until May, traders had a net short position for three years. The enthusiasm of traders is shared by businesses across the region, with business confidence indexes reaching record or multiyear highs. In France, where newly-popular president Emmanuel Macron is pushing through labor reforms, business confidence is at the highest level since 2007. The index’s reading of 112 is well above the long-term average of 100, the statistics office said. Notably, the southern nations of the euro zone have come a long way from the depths of the 2012 sovereign debt crisis, which resulted in international bailouts and eventually unprecedented monetary stimulus from the European Central Bank. 2017’s turnaround for these countries is emphasized by a swath of debt rating upgrades. In October, S&P unexpectedly upgraded Italy’s credit rating for the first time in three decades. The previous month, S&P raised Portugal’s rating to investment grade after five years as “junk” debt. 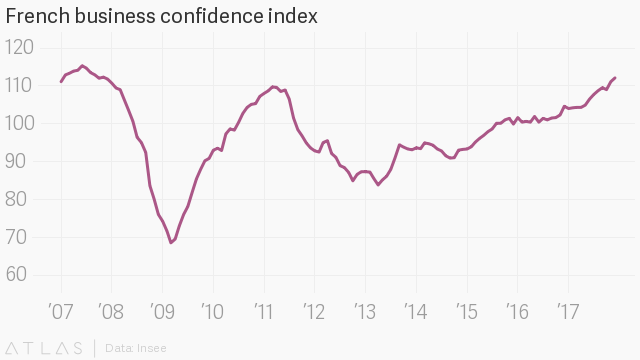 One of the brightest signals of the euro zone’s improvement might be from Greece. Just two years after almost being pushed out of the currency union while trying to organize a bailout, the nation has managed to return to bond markets this year and had its credit rating upgraded by both Fitch and Moody’s. 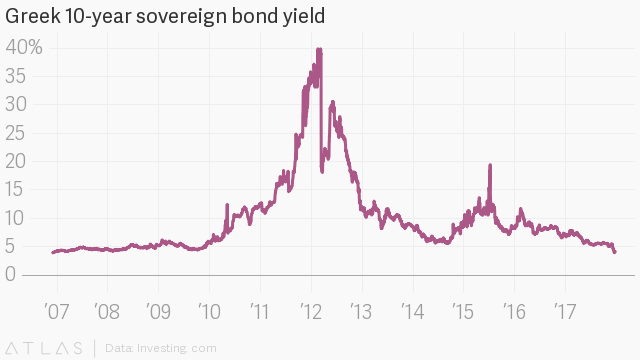 In July, Greece was turning away investors who wanted to get their hands on their bonds. It seems the debt restructuring and massive losses for bondholders in 2011 have been cast to the back of investors minds. The yield on 10-year Greek bonds fell below 4% this month, the lowest in 11 years (paywall). Bond prices rise when the yields falls, and UBS are expecting more gains. One of the Swiss bank’s top trades for 2018 is to go long on Greek government debt. The bounty of economic gains have been even wider outside of the euro zone. 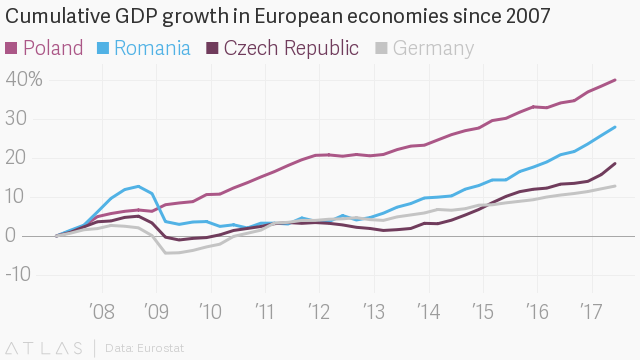 Eastern Europe’s three biggest economies have been outpacing even German growth for the past few years. Poland, Romania, and the Czech Republic are experiencing a “Goldilocks moment” of high economic growth, low unemployment, and manageable inflation. There’s still several risks to watch out for in 2018. Most euro-zone countries are experiencing a “job-rich but low-wage” recovery, warn analysts at HSBC. Wages will need to rise faster to keep consumer demand up. It could be “the definition of insanity” to assume European markets will keep rising without decent productivity growth and low earnings, HSBC said. Meanwhile, some of Europe’s eastern countries have the opposite problem of wage growth that is too fast thanks to government fiscal boosts. They’re now outpacing productivity growth, which risks overheating the economy. The biggest concerns stem from politics. Uncertainty, upheaval and right-wing populism threaten to unnerve investors and derail economic growth. Germany will begin the new year with a caretaker government, as Angela Merkel tries again to form of governing coalition, impeding some efforts to reform the euro region. A fractured group of Catalan separatists narrowly won the most seats in the region’s election but will struggle to form a coalition and take their independence bid forwards, likely leading to more clashes with Madrid. Italian elections have been scheduled for March, with an anti-establishment party closing in on first place. Meanwhile, far-right populism is gaining ground in other countries. In Austria, the nationalist Freedom Party has entered into a governing coalition, which led a European Commissioner to warn that “the presence of the extreme right in power is never trivial.” Poland’s judicial reforms, which are widely regarded as a threat to democracy, have forced the European Union to use a never-used-before “nuclear option” that could potentially strip the nation of its voting rights in order to try bring the country back into line with the union’s values. All this being said, the political uncertainty of 2017, which included dramatic French and German elections and Catalonia’s independence declaration, didn’t stand in the way of economic growth. While economic and political reforms are needed across the region, there’s plenty of momentum to start 2018 with a bang.